Distributor: R1 DVD and VHS from Pioneer / Geneon out of print. 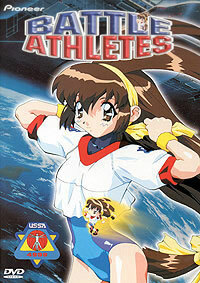 Notes: Based on the Sega Saturn video game "Battle Athletess Daiundoukai" by Increment-P, released only in Japan. In the year 4999, the biggest sports event around is held in the famous "University Satellite" in space, where girls from around the world compete for the title "Cosmic Beauty". 16 year-old Akari Kanzaki, daughter of Mido Tomoe (the highest ranking Cosmic Beauty ever), hopes to do well aboard the University Satellite and become famous like her. Along with her friends Kris and Anna, Akari faces any competitors who come her way. But will she able to keep up when the other girls, even her friends, are doing better in sports than her? And what about the violent upperclassman, Mylandah, who seems to have a grudge against her? Yet another anime where another girl faces impossible odds and ends up succeeding in the end? Please. That was my first impression of Battle Athletes. When I watched the first two episodes on VHS over a decade ago ago, I thought to myself, "there's nothing interesting about this anime here. All it has going for it is cute characters. I think I'll pass on the rest of the series." It's a good thing I decided to give Battle Athletes a second chance a few months later, or else I'd have the same opinion of the whole series as I did when I first started it. Still, the first thing that will come into your mind upon watching Battle Athletes is how recycled the art style feels, right down to its character designs recycled from other AiC productions such as Tenchi Muyo! Ryo-Ohki and El Hazard. The plot is no winner, either. Determined underdog, who has a famous mother who was good in something (in this case, sports), attempts to duplicate her parent's abilities and live out her dreams at the same time. And of course, the parent she looks up to, in this case her mother, is dead. So she tries her hardest, gets harassed by upperclassmen, and then shows them just how good she really is. We've seen all this before in series like Gunbuster, and it's no different here. Well, except for its oodles of fan service (not like I'm complaining about that or anything). So what saves Battle Athletes? It's definitely not the story (daughter goes to same school as mother, wants to emulate her, makes friends and enemies, and jumps over them), but the characters and animation. The characters are a mostly likable bunch, especially heroine Akari (though sadly no Akari House from the later TV series, I'm afraid). Kris, her best friend and later rival, has some nuanced scenes here and there, and African cat-girl Tanya (who literally runs on all fours to emphasize her cat-girl traits) is energetic and fun, and far more tolerable than Merle from Escaflowne. And then there's Akari's "rival" (more like the villain of the series), Mylandah, who can be best described as "completely insane". Yeah, let's go with that. As is it an OAV series about a girl playing sports, Battle Athletes does indeed show off its animation and art the best it can. While not AIC's most impressive looking work, there's still a decent frame rate and nice backgrounds to look at, which looks refreshing to me amongst the digital era we live in today. Being only six episodes long, the action in this series moves fairly quickly as well. Unfortunately, however, a short time frame results in rushed character development. Akari suddenly goes from being a wimpy loser to the most competence runner ever, and her friend Kris's whole personality does a sudden, jarring 180 about halfway through the series. Fortunately, Battle Athletes provides enough little plot twists and turns to keep your attention. The humor doesn't always hit the mark either, but there is one scene I find funny. In a later episode Headmaster Grant, the sole male on the University Satellite, tries to train Tanya to use her body in a later tournament that comes down to girls versus boys. While this trick seems to work with some of the other boys in the tourament, Tany'a, um, charms (she looks like a boy with long hair) have no effect on her opponent as he's gay. The reaction to the revelation is priceless. While hardly revolutionary, Battle Athletes is overall a fun little anime if you're looking for something short, sweet, to the point, and riddled with eye candy. Do avoid the English dub if you can, though. Recommended Audience: One of Akari's roomates gets naked (front and all) in the second episode, along with many other scenes of fan service (to quote Akari herself in the 3rd episode preview, "Leave it to Pioneer!"). There's also quite a bit of cursing in the English version, and violence of both the slapstick and non-slapstick kind as well.